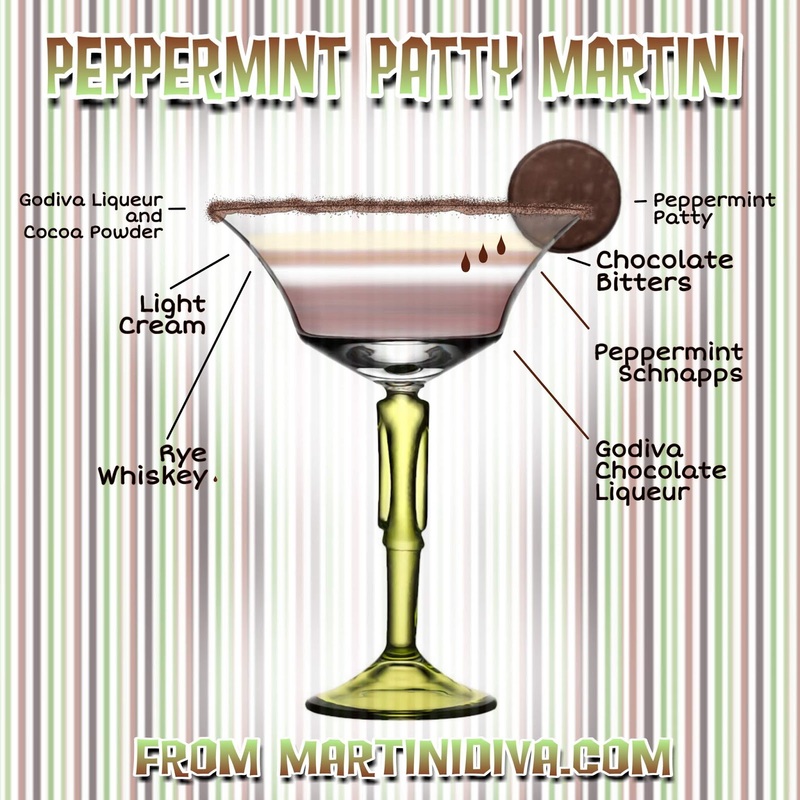 This is among my top searched cocktails. 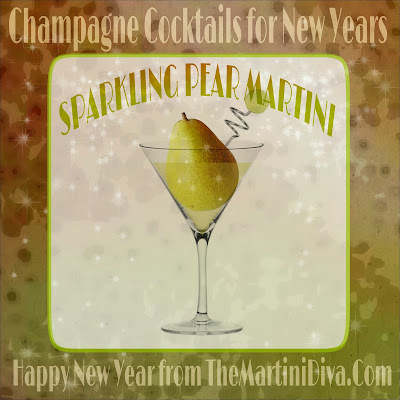 If you're a pear fan this martini is a great way to ring in the New Year. 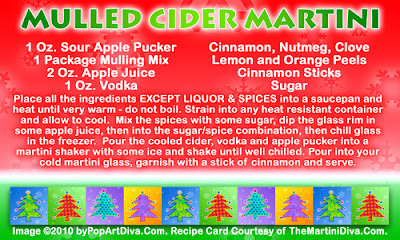 Pear is a wonderful winter fruit for a holiday cocktail and blends well with sparkling wines. If you want something a little less high octane leave out the brandy and use a highball or Collins glass then top off with club soda or sparkling pear juice. 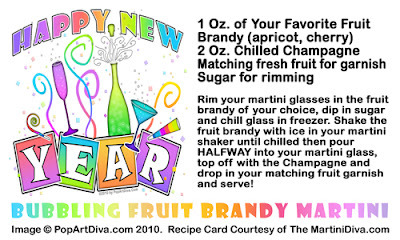 Add the pear brandy and pear juice to the chilled flute, then top off with Champagne. Garnish with pear slice and serve. 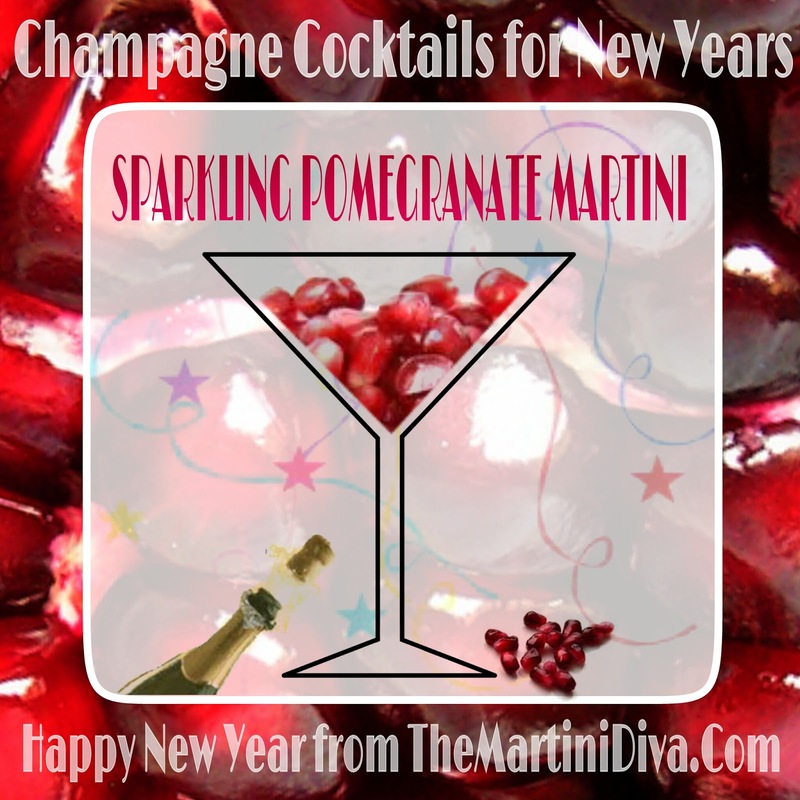 Thanks to Oprah, the Pomegranate Martini became one of the hottest cocktails around a few years back. Pomegranate is still a popular flavor profile and it's also healthy because it's rich in antioxidants. 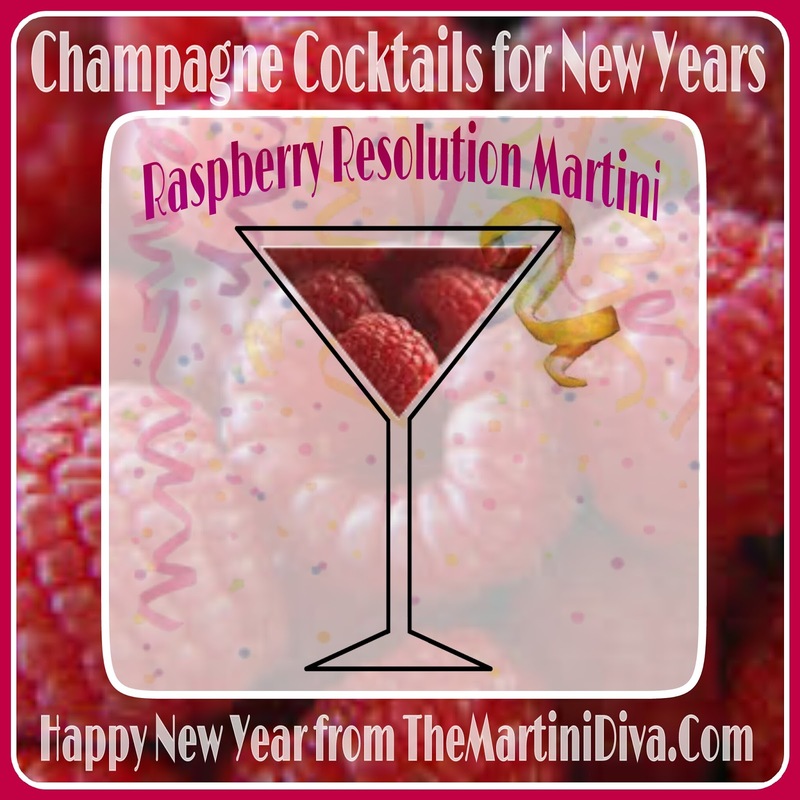 With my Sparkling Pomegranate Martini I've used pomegranate vodka instead of citrus vodka and replaced the sparkling water with Champagne for New Year's, giving the martini a much deeper pomegranate flavor and a touch more sweetness. 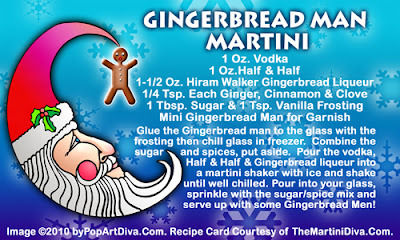 Rim glass with sugar then chill glass in freezer. 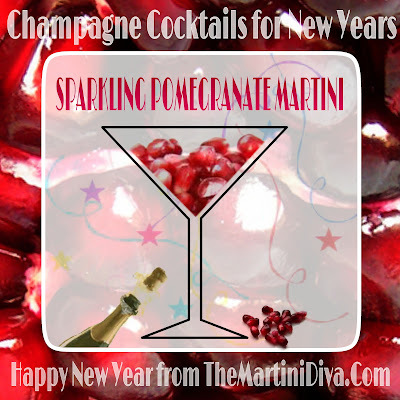 Add the pomegranate vodka and pomegranate juice to the chilled flute, then top off with Champagne. Drop in the pomegranate seeds and serve. 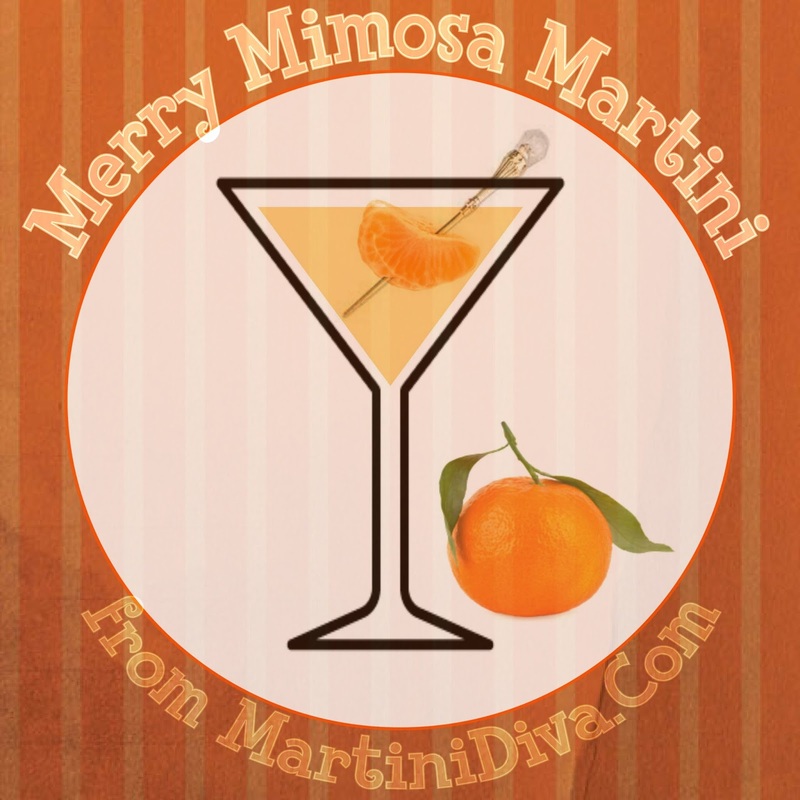 This is a twist on the classic Mimosa cocktail of Champagne and orange juice, the addition of Cointreau and a bit of blood orange honey pumps up the mimosa to the next level. I use tangerine juice instead of orange juice as well. Tangerines tend to be sweeter and less tart than most varieties of oranges. If I can get my hands on enough ripe tangerines I will make this with fresh tangerine juice but you can use frozen or bottled juice. *Mix 1 Teaspoon of Honey Ridge Farms Honey Creme Blood Orange with 1 teaspoon of hot water and stir until mixed. Add the blood orange syrup, tangerine juice and Cointreau to the chilled flute, then top off with chilled Champagne. Garnish with a tangerine slice and serve. 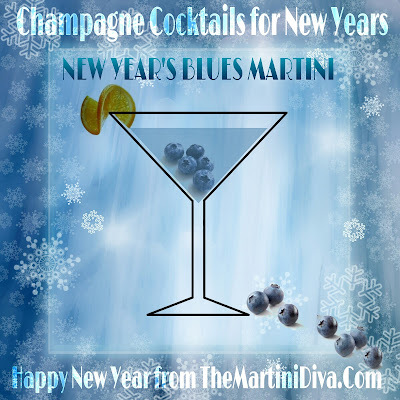 The Bubbling Fruit Brandy Martini is simply a mix of Champagne with your favorite fruit brandy. 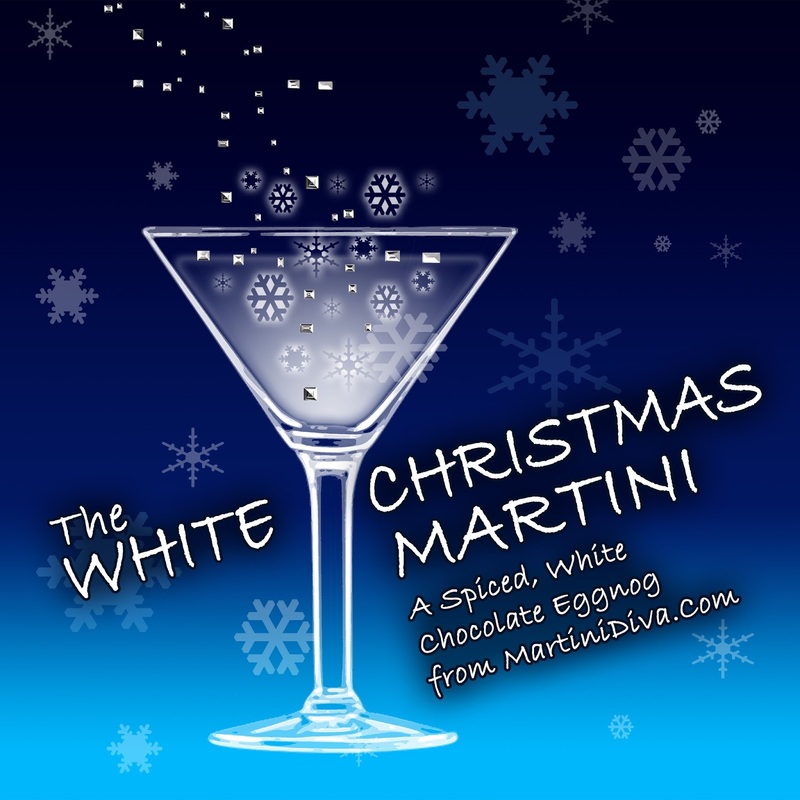 The Amaretto and Chocolate WINTER SNOWFLAKE MARTINI RECIPE has moved here. 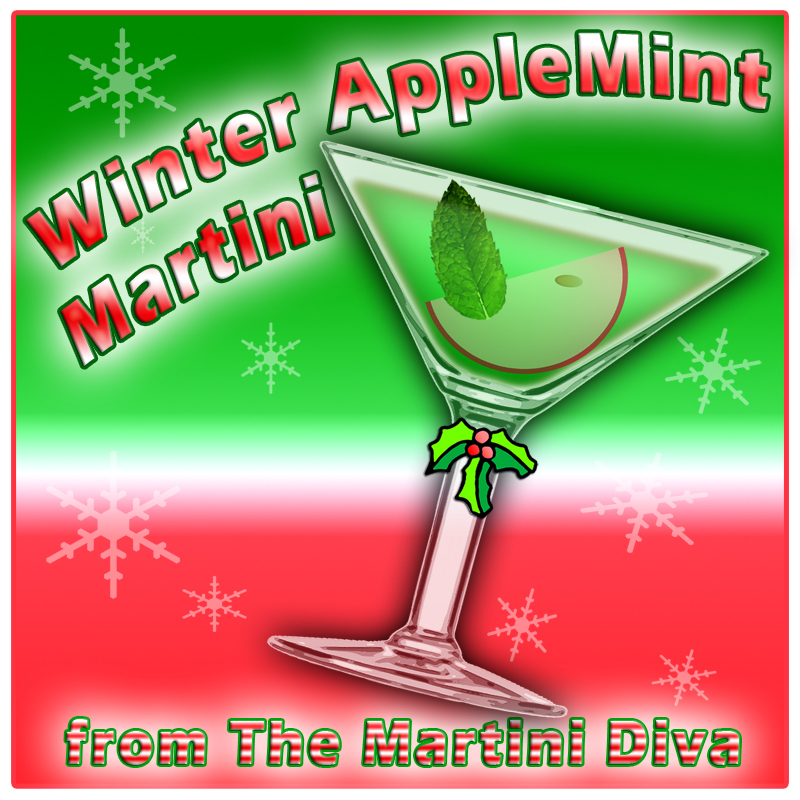 WINTER APPLE MINT MARTINI has moved here. 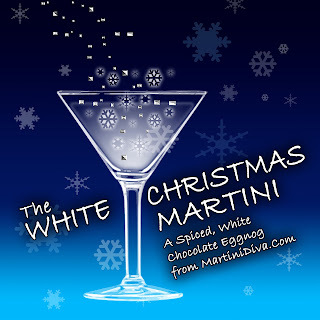 THE CHRISTMAS MARTINIS & COCKTAILS have moved HERE. 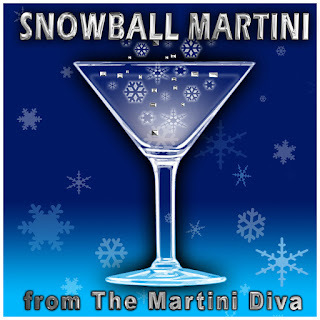 The SNOWBALL MARTINI RECIPE has moved here. 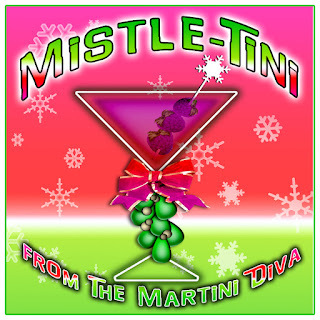 CHRISTMAS MARTINIS - The Merry Cherry MistleTini! 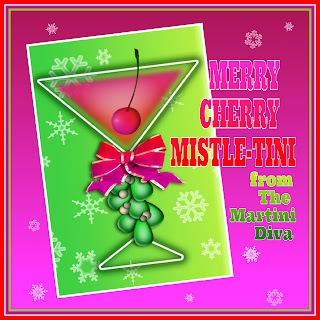 The MERRY CHERRY MISTLE-TINI has moved here. CHRISTMAS MARTINIS - Jolly Santa Martinis! 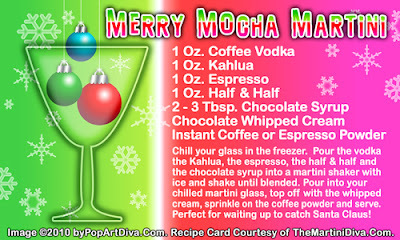 CHRISTMAS MARTINIS - The HO HO HO Martini! The HO HO HO MARTINI RECIPE has moved here. Recipe for The Happy Elf Martini can now be found here. 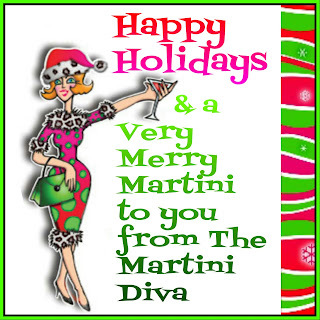 Need a great hostess gift, stocking stuffer or gift? DIRECTIONS Chill glass in freezer. Shake ingredients in an ice filled cocktail shaker. 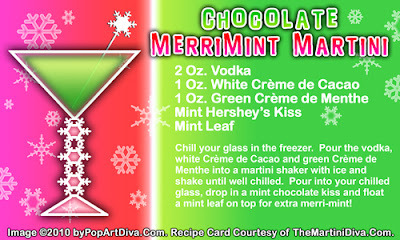 Strain into your chilled glass or cup. Dust with freshly ground nutmeg, add cinnamon stick and serve. THE MERRY MARTINI MIXOLOGY BOOK: My Christmas Martini Book is Published! 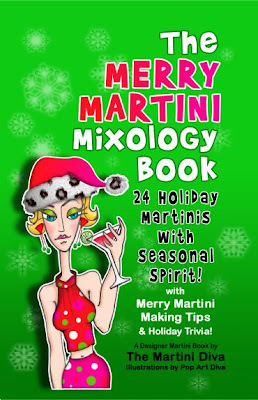 TheMERRYMARTINIMixology Book (Check It Out Now) A Holiday Happy Hour of 24 Unique & Colorful CHRISTMAS MARTINI RECIPES with Merry Martini Making Tips & Tricks along with Christmas Trivia, Quotes & Fun. 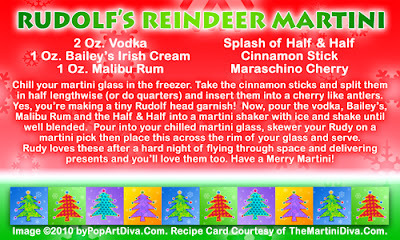 Full Color throughout and illustrated in joyful style by Pop Art Diva, every recipe page gives you the ingredients, tools and directions to a perfect Christmas cocktail. 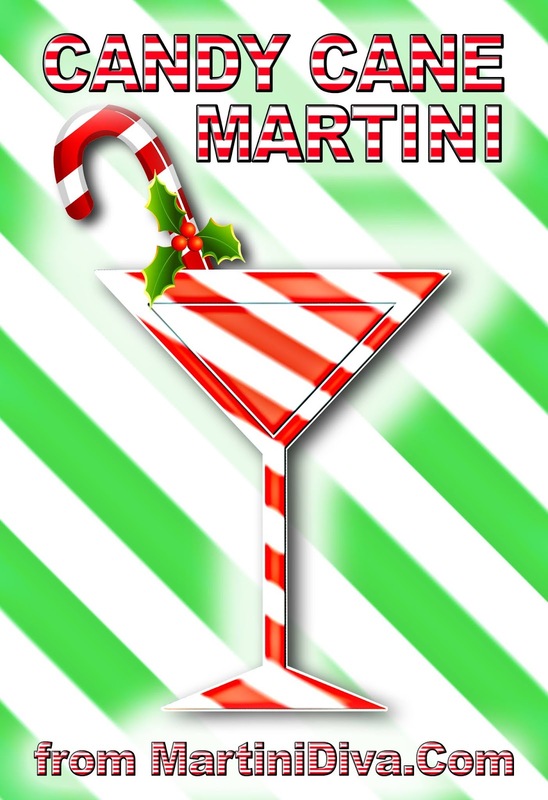 Each facing page has a Merry Martini Making Tip as well as holiday trivia and interesting tidbits relating to each martini. 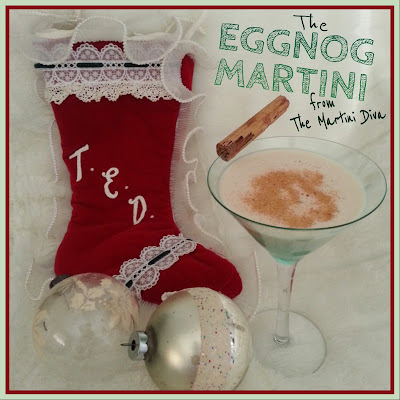 Why serve up dull eggnogwhen you can wow them with fun grog? and share the fun for a holiday lift! 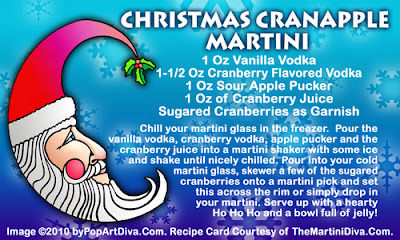 CHRISTMAS MARTINIS - The Christmas Cosmo! 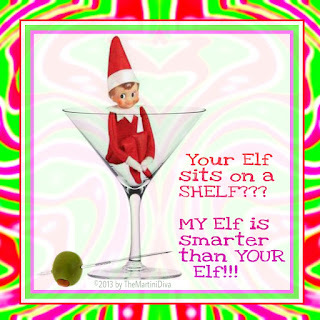 The CHRISTMAS COSMO RECIPE has moved here. 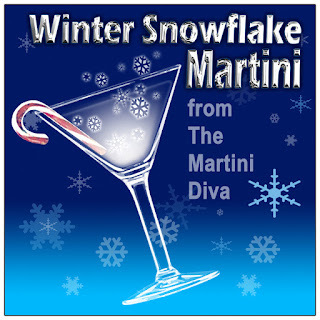 The Limoncello, Pomegranate and Red Grapefruit ANGEL'S KISS MARTINI has moved here. 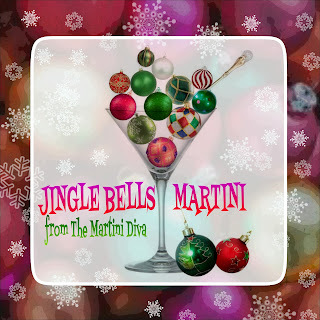 It's the most wonderful time of the year again and starting today I will be posting one martini recipe for every day leading up to Christmas! 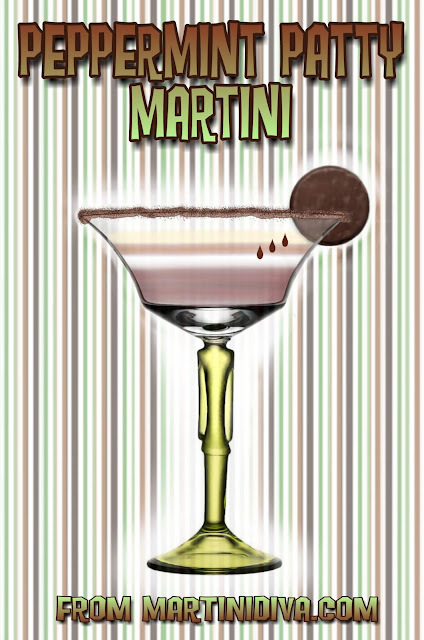 Today is the Angel's Kiss Martini inspired by my first bottle of home made Limoncello liqueur. Paired with pomegranate and grapefruit juices this is a martini with some zing from the tart fruits which are balanced by the sweetness of the Limocello, the simple syrup and the sugar rim. 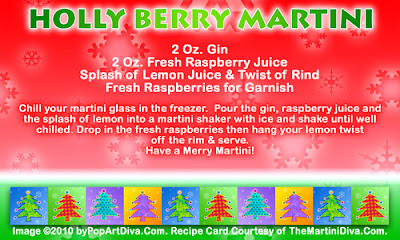 This is a perfect pick-me-up martini to enjoy after the long days of super sales and holiday shopping you're enduring to bring Christmas to your friends and family! It's like getting an angel kiss for all the hard work!